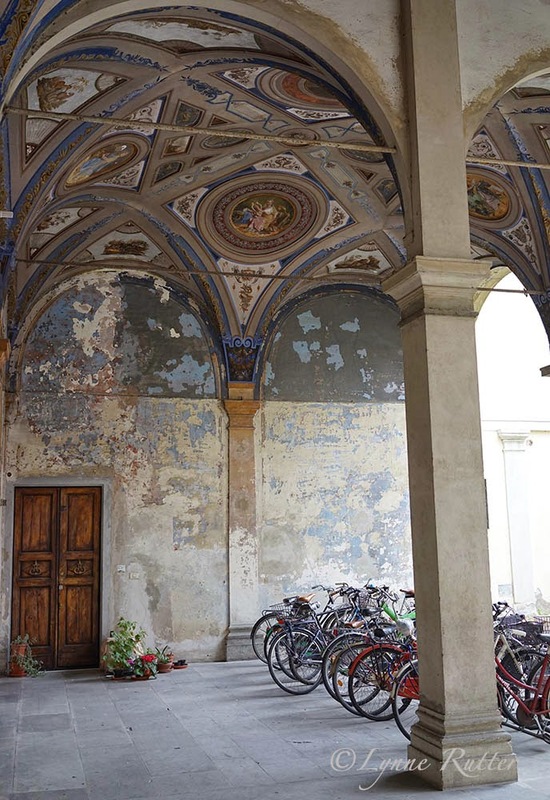 Wandering through the Santa Croce District I happened upon this beautiful and curious sight, a painted loggia aging quite gracefully. Far from abandoned, this is now serving as the entrance to several residential buildings. From the courtyard communicating between buildings you can see the loggia where the neighbors are storing their bicycles. 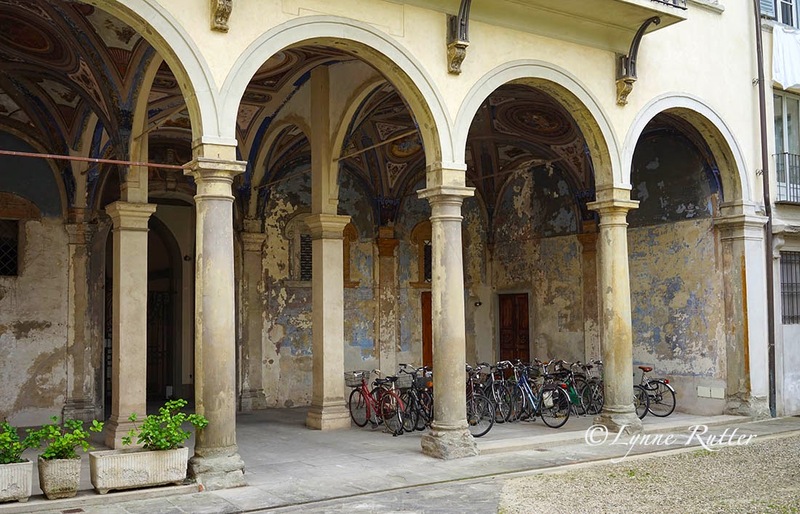 The loggia also shelters the urbane entrances to several apartments. 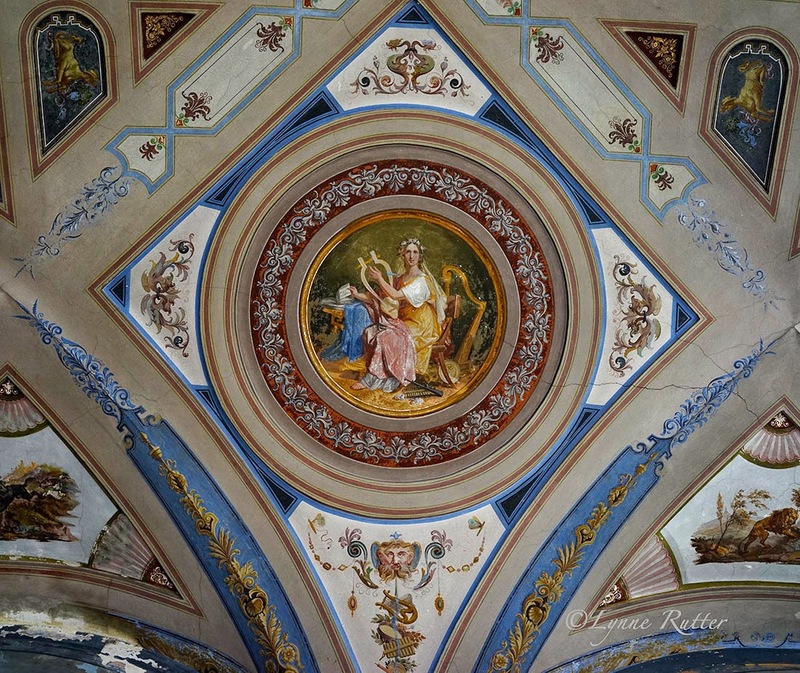 detail of the ceiling ornament, with music. 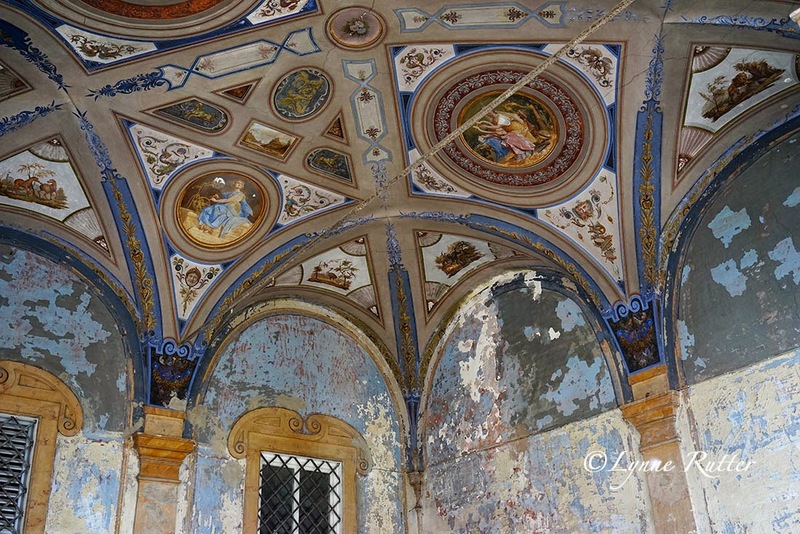 The ceiling is painted with mix of neoclassical and grottesca ornament from the early 1800's, using a secco-fresco technique and a healthy serving of that delicious French Ultramarine Blue, whose invention made decorating with blue not only possible, but fashionable as well. The ornament features allegorical figures representing the arts (music, architecture, painting, sculpture, etc) alternating with grottesca, classical motifs, vignettes of charming European towns, and scenes with animals domestic or exotic. Looks like they threw the whole book at this ceiling. 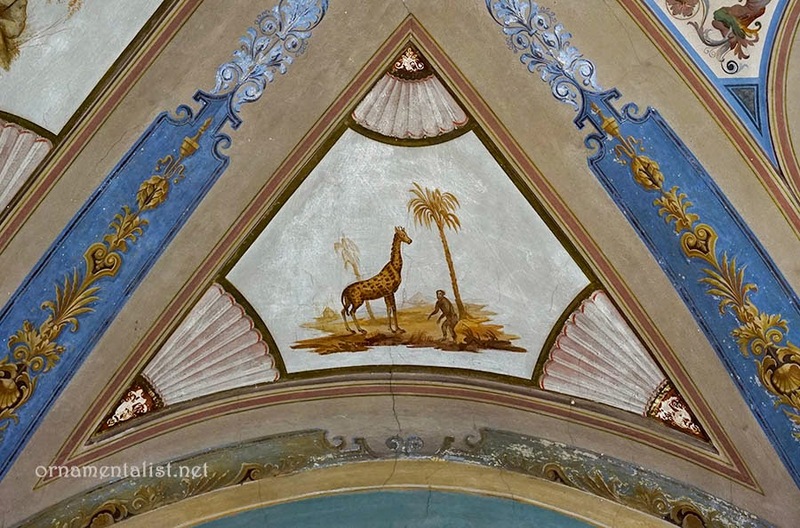 A giraffe and a monkey. And why not? Much of the surface is peeling and there may have been one attempt to touch it up in the past, but I actually like the way it looks in this context. 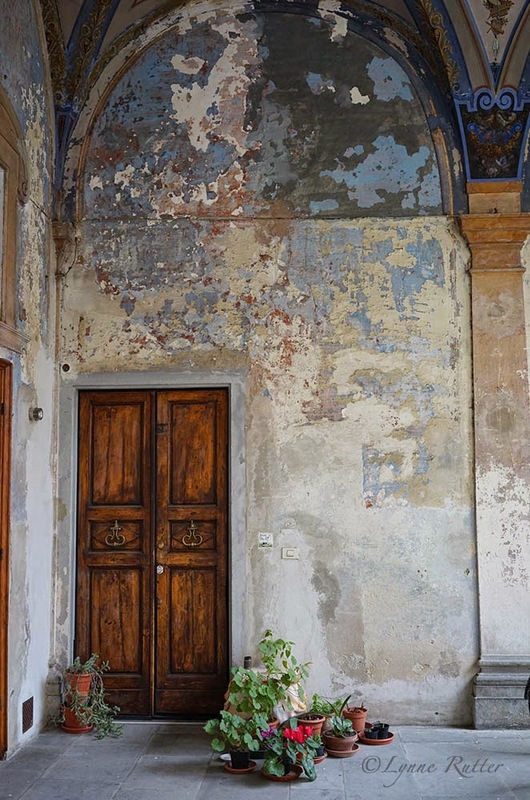 To me, the artful decay adds dignity to this setting. My favorite kind of find! A rough diamond! I see it more like a brilliant cut diamond in a tarnished setting! I like the artful decay of the walls (I have a great book in my library on the artful decay of them), but I'd hate to lose any more of that ceiling! well it's survived a long time already - over 150 years at least - but it's the nature of that painting technique to give up at some point. So I feel lucky for having found it at all.